I made AVI file in VirtualDub? Filter Mod version 10. But it does not play in ffplay.exe. b64a.mov​ (2.3 MB) - added by cehoyos 3 years ago. b64a.patch​ (1.2 KB) - added by v0lt 3 years ago. Which player plays the sample you provided? 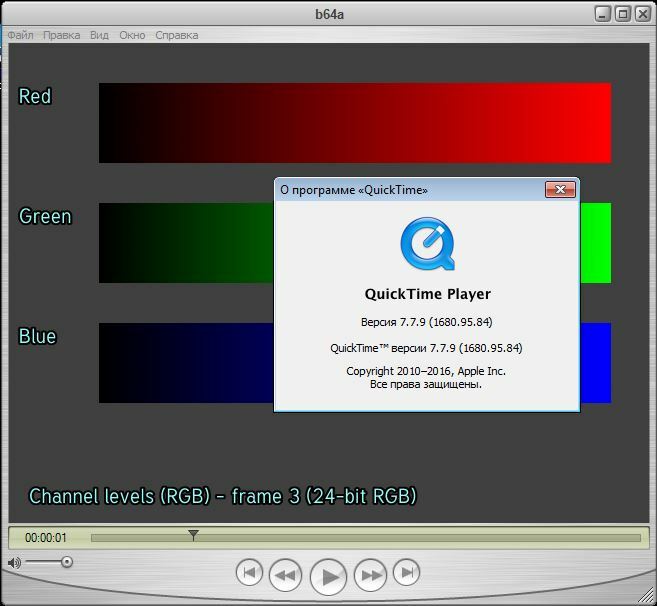 The QuickTime? 7 player I have here refuses to play any avi files, how do you test? I can confirm that this file decodes correctly with QT 7.6 on Win. I ran Quick Time Player 7.7.9 and pulled the file in the player window. The file is played correctly. This either needs a (trivial) codec or a new colourspace in libswscale. I think there packet ARGB64BE format. If swap all the bytes of the pixel, we get AV_PIX_FMT_BGRA64LE. Or change the position of the alpha channel, then we get AV_PIX_FMT_RGBA64BE. I just sent your patch to the development mailing list, in the future please prepare your patches with git format-patch and send them to ffmpeg-devel, patches are generally ignored on this bug tracker. I also think they packaged as ARGB64BE indeed. I'm not sure what the patch proposed is doing exactly, but it seems like it interprets AV_PIX_FMT_RGBA64BE as ARGBBE when codec is b64a. Wouldn't it make more sense to add a new AV_PIX_FMT_ARGB64BE pixel format? To also allow conversion from/to this format for example. But this would probably requires more work to fully support it everywhere..